Here is one of my favorite recipes from my new book “Cooking Wild”. It’s available now in bookstores and via Amazon. Now is the time to pick nettles or get at your local Farmer’s Market. Despite the sting of their prickly leaves they secretly are both good tasting and good for you. The sting comes from formic acid in the hairy leaves which is neutralized when cooked. 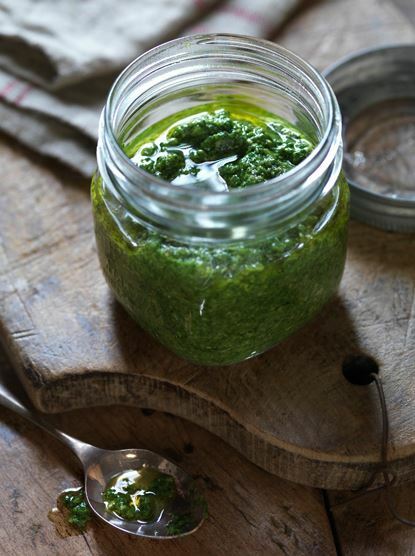 Nettles are greens with amazing culinary and medicinal properties. They are high in iron, potassium, manganese, calcium and vitamins A and C (and are also a decent source of protein). The word “nettle” describes more than 40 different flowering plant species from the Urtica genus, which comes from the Latin word “uro,” meaning, “I burn.” The plant is native to Europe, Asia, Africa and North America, and is found wild throughout the continental United States. Nettles are readily available in spring.